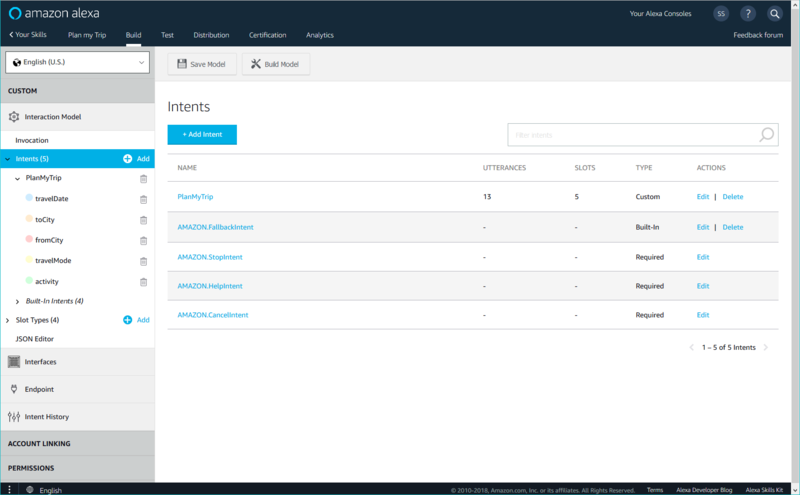 Use the Build page to set up your skill, configure settings specific to the interaction model, and specify the endpoints for your service. All the configuration options for your skill are available as links in the left-hand column (sidebar) of the Developer Console. This document provides an overview of the options in the sidebar and links to more information. The items you see in the sidebar for your skill depend on the interaction model you added to the skill. 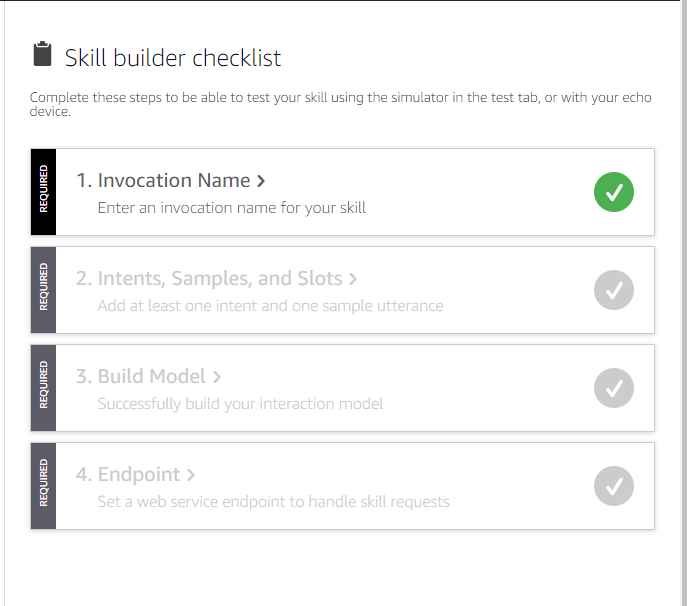 For a skill with a custom model, the main Build page displays the Skill builder checklist. This shows your progress through the minimum steps to create a skill and get it ready to test. The following table summarizes the configuration options for a skill with a custom model. All of these items are in the left-hand sidebar under Custom. Use these sections to create the interaction model for your skill. Provide the invocation name for your skill. This is the phrase users say to begin an interaction with your skill. See Choose the Invocation Name for a Custom Skill. Create and edit your intents, slots, and sample utterances. An intent represents an action that fulfills a user's spoken request. Intents can optionally have arguments called slots that represent variable information in the request. A sample utterance is a phrase users can say to invoke a particular intent. You provide a set of sample utterances for each intent. Create custom slot types and search for built-in slot types to use in your intents. Every slot included in your interaction model has a type that determines how Alexa handles the user's spoken data the user provides. For example, the AMAZON.NUMBER slot type converts words like "five" to numbers (5). List types provide a set of values that can be recognized, such as a list of first names or cities. View and edit your interaction model for your skill in JSON format. You can make changes directly to the JSON and then click Save Model. You can also use this section to upload a JSON file. For details about the JSON schema for the interaction model, see Interaction Model Schema. Audio Player for streaming audio. CanFulfillIntentRequest to help ensure that Alexa directs to your skill only those customer requests, questions, or statements that are a good match for the skill. Display for display templates on Alexa-enabled devices with a screen. Gadget Controller to send directives to Echo Buttons. Game Engine to receive input from Echo Buttons. Auto Delegation indicates whether to automatically delegate dialogs to Alexa. When enabled, this applies just to intents defined with a dialog model. You can override this setting at the intent level. Video App for streaming video. Specify the endpoint for your skill. Alexa sends requests to this endpoint when users invoke your skill. If you are hosting your service as an AWS Lambda function, select the AWS Lambda ARN option and enter the ARN for your function in the Default Region endpoint text box. 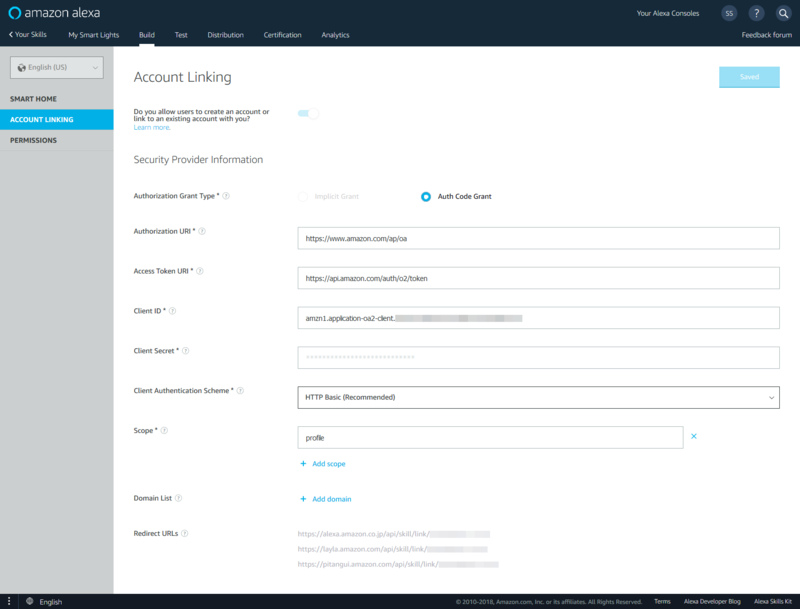 If you are hosting your service as a web service, select the HTTPS option and enter the full URL for your endpoint in the Default Region text box. You can optionally provide multiple endpoints for better latency in other regions. Note: If you host your skill as a web service, you must configure an SSL certificate. Your endpoint must have certificate from a trusted certificate authority, or your endpoint must be a sub-domain of a domain with a wildcard certificate from a trusted certificate authority. For testing purposes, you can create self-signed certificate, but this can only be used for testing. View aggregated, anonymized frequent utterances and the resolved intents. This data is available for a given locale if your skill has at least 10 unique users in a day in that locale. For details, see Review the Intent History for a Custom Skill. Skill builder checklist displayed on the default Build page. In this example, only the **Invocation Name** has been provided. The following table summarizes the pre-built model sections. You can fill in these sections in any order. Only the model you selected is shown in the left-hand navigation of the Build page. Add feeds to your skill and configure a custom error message. 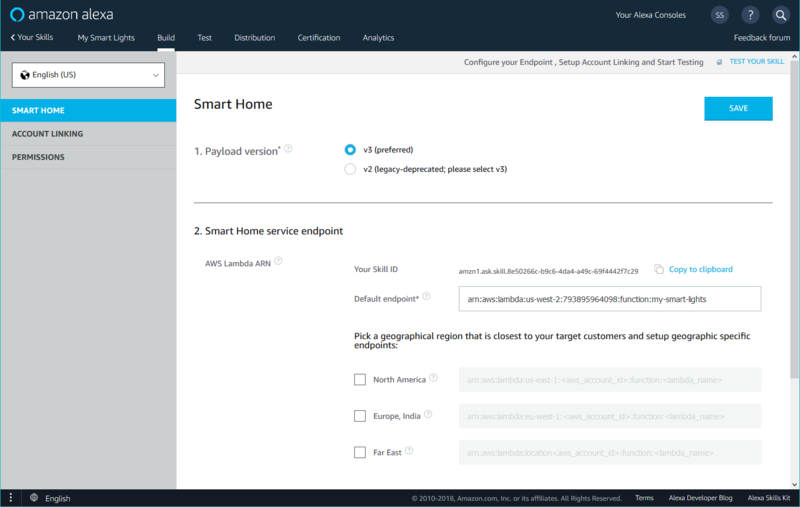 Specify the AWS Lambda ARN endpoint for your smart home skill. Skills with the smart home model require account linking. Click Setup Account Linking to jump to the Account linking section within Capabilities. Specify the AWS Lambda ARN endpoint for your video skill. Skills with the video model require account linking. Click Setup Account Linking to jump to the Account linking section within Capabilities. Use this section to configure your skill to connect the identity of the end user with a user in another system. Account linking is optional for skills with a custom model, and required for both the smart home and video models. 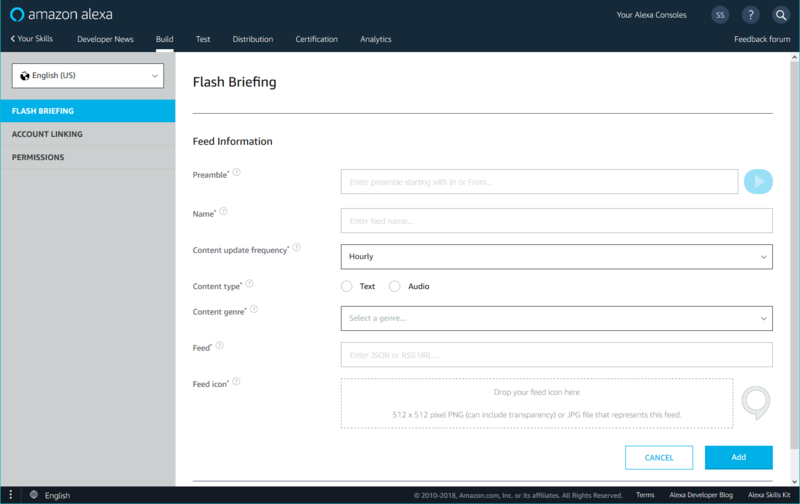 Account linking does not apply to flash briefing skills. Account linking must be configured with authorization code grant. The skill can use either authorization code grant (recommended) or implicit grant. 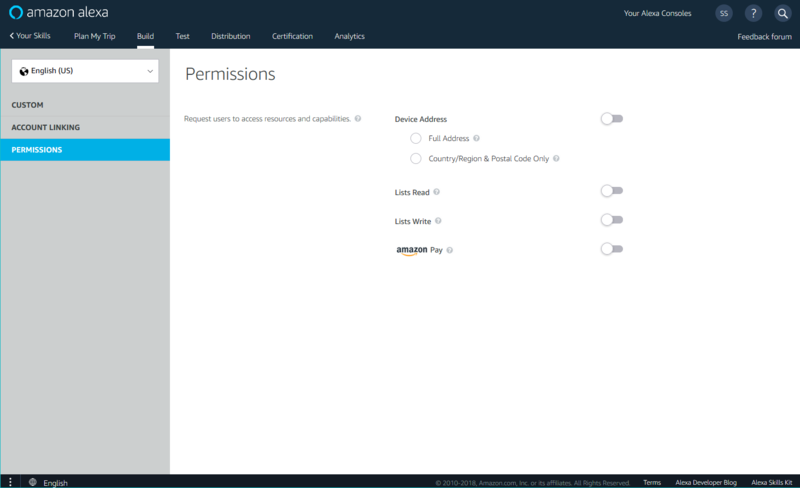 Use this section to configure your skill to ask the user for permission to access specific personal information. The available permissions depend on the model included in your skill. Lets your skill ask the user for access to the address information configured for the device. Provide access to the user's shopping and todo lists. See Access the Alexa Shopping and To-Do Lists. Lets users pay for goods and services in your skill using their Amazon account information. See Amazon Pay for Alexa Skills. Gives your smart home skill permission to send events to the Alexa event gateway. You can use this to send proactive state reports to Alexa. 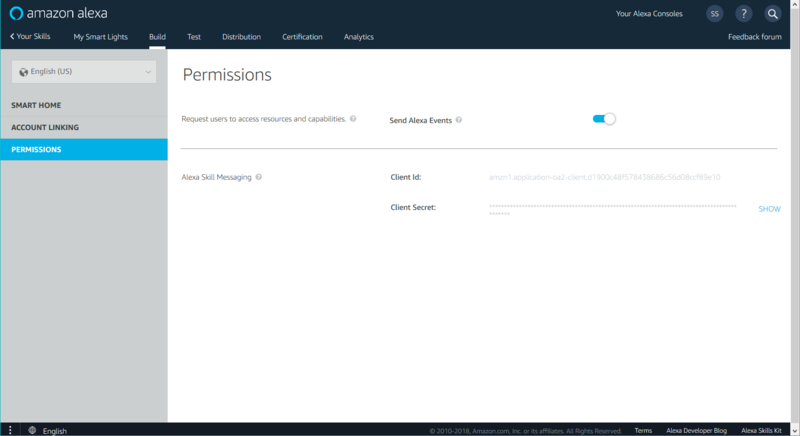 Provides the Client Id and Client Secret values needed to send messages to your skill. This is displayed only when it applies to the skill based on the selected permissions.